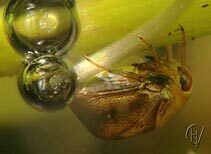 This Pygmy backswimmer caught a Water flea and is now resting with the tip of the abdomen touching the water surface. The prey is stabbed with the pointed beak, injected with protein dissolving saliva and sucked out. 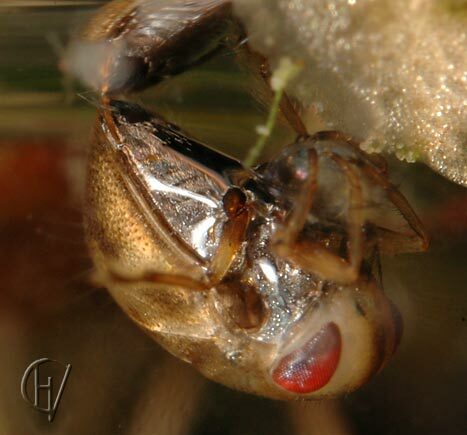 The front and middle legs of the Pygmy backswimmer are raptorial legs, just like those of the larger Water boatman. Mark the silvery hairs on the belly. 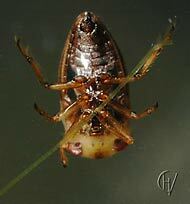 Because Plea species are small, they can hold an air bubble without the special folding hair fringes of the Water boatman, they only have a keel-shaped protrusion that enlarges the possible size of the bubble. Plea has the shape of a small boat. (Greek pleon: boat, sailor, Latin minutissima: small). Click on the pictures below to see enlarged versions. The right one is a picture of a Plea larva, made by Jaap Cost Budde. The same specimen. At left a Water flea. The photo below is made from above the water surface. 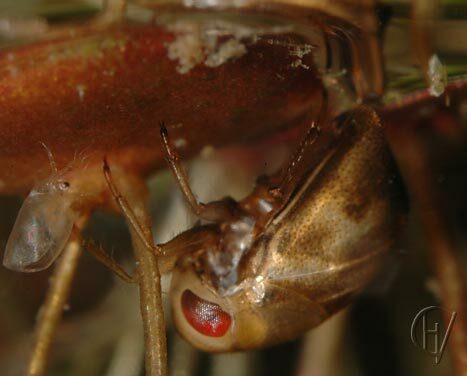 The Pygmy backswimmer ventilates its air supply along the tip the tip of the abdomen.